Selected video and photographic documentation. Courtesy the artist. THEODOROS, sculptor, Anti-Spectacular Theater, 1976. Two sculptural one-act plays - Elegy of the Homo Faber: I. Primary work of sculpture-without quality, without message or content... (1974), II. In the limits of tolerance (1973). Courtesy the artist. Theodoros, sculptor (Papadimitriou) approaches performance as the primitive action of mankind, trying to communicate through the shaping of materials by the primary tool of "matraque", in order to express basic values. 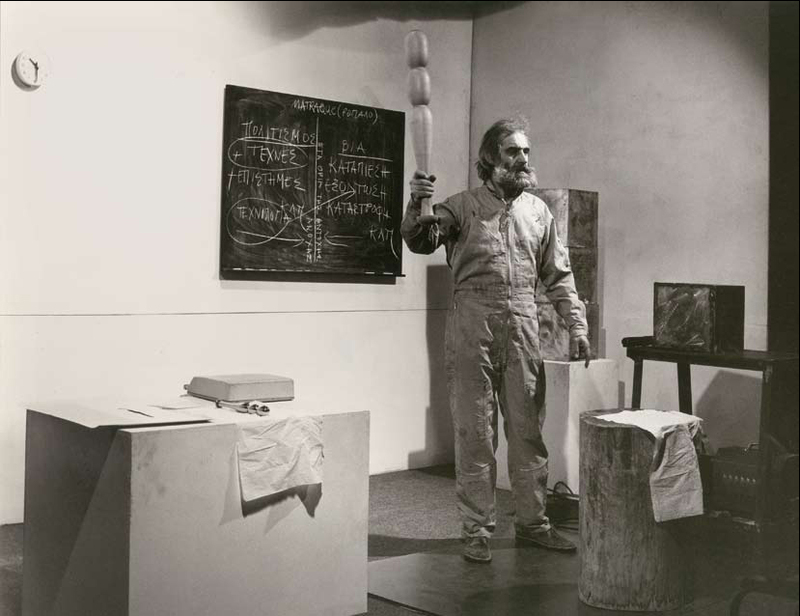 His performances have been sharply criticized at home by the regime press, driving him to wander in France and America, where he will teach Sculpture for a semester in the California State University at Hayward. Between 1970 and 1983 he develops the project Manipulations, in which he tries to communicate through all the senses, breaking the autonomy of "audiovisual culture" of contemporary Arts. The VENICE INTERNATIONAL PERFORMANCE ART WEEK 2016 presentes video and photographic documentation of his work.